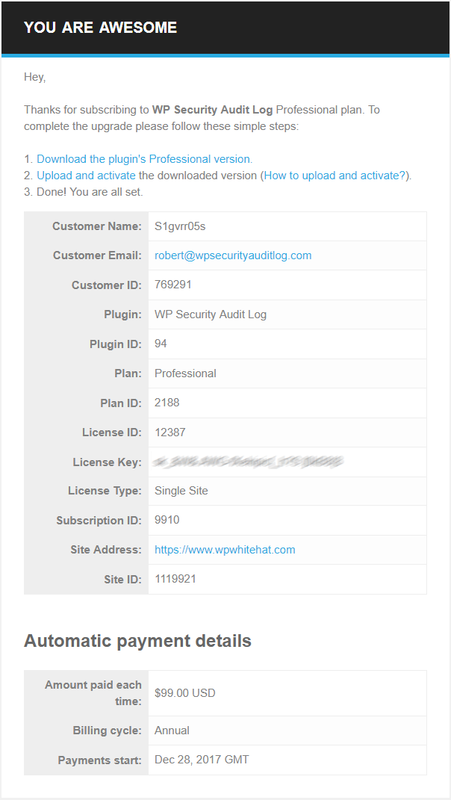 You can purchase the premium edition of the WP Security Audit Log plugin from within the plugin itself or from our pricing page. When you purchase from within the plugin itself you can enable the option Automatically install the plugin after the upgrade so the premium edition of the plugin is automatically installed when the purchase is completed. 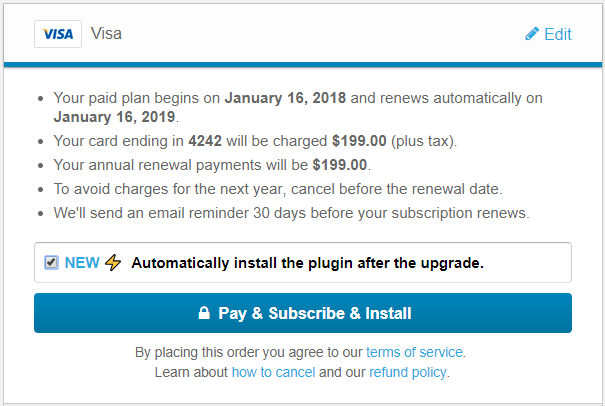 If you purchase the premium edition of the plugin through our website you will receive an email with instructions. A copy of the email is shown in the below screenshot. Below are the instructions of how you can manually install the Premium edition of the WP Security Audit Log plugin. NOTE: When you install the premium edition the logs generated by the free edition of the plugin will be retained, unless you enabled the setting Remove Data on Uninstall. If you enabled the setting, disable it before deactivating the free edition and installing the premium edition. Download the zip file by clicking the download link in the email. Login to your WordPress dashboard, navigate to the Plugins page and click the Add New button. Click Choose File and select the plugin’s zip file you have just downloaded. Click Open and Install Now to start the installation. Once the installation is complete click Activate Plugin. That is it. The premium edition of the WP Security Audit Log plugin should now be installed and the free version is automatically deactivated, as can be seen in the below screenshot. Should you encounter any issues while installing the premium edition please contact us. We’d be more than happy to assist.